Home > FAQs > What is Green Office Accreditation? Companies eager to employ good environmental practices and get official recognition for doing so should seek green accreditation. To help understand it, we present answers to some frequently asked questions. The aim of green accreditation schemes is to assist and reward those companies that want to go beyond the minimum legal environmental compliance and improve their green performance. To achieve this, the company must adhere to a formal set of guidelines mapped out by the individual award scheme. These are known as Environmental Management Systems (EMS). Why Should My Company Seek Green Accreditation? There are two main benefits to green accreditation. Firstly, it proves your company’s commitment to tackling climate change to the world. It is a badge of honour that will work wonders for your company’s reputation. Secondly, it will provide you with a valuable framework for improving your organisation’s practices that will not only benefit the environment but also company performance and profits. With increased environmental legislation and regulation, higher energy and waste costs, as well as greater pressure from partners, clients and the public to ‘go green’, it is actually becoming harder for companies to not embrace new environmental management methods. What Types of Green Accreditation is Available? There are now a variety of different award schemes available to businesses looking to improve their green performance and gain recognition for doing so. These include the Green Mark award, the Eco-Management and Audit Scheme (EMAS), the Institute of Environmental Management and Assessment’s (IEMA) Acorn scheme, and the ultimate award for any business with dreams of green totality, the ISO 14001. These all assist with the accreditation process. There are other types of accreditation which just celebrate achievements, such as the National Energy Efficiency Awards. Aside from the ISO 14001, each award schemes offers a good place for companies to start actively improving their green credentials. And they achieve any of these goals and still want to go further, they can all be used as platforms to reach full ISO 14001 accreditation. What is the Green Mark Award? The Green Mark award is cost-effective and easy to use tool in aiding business make improvements in their environmental performance. It is recognised for its clear and achievable goals, for being simple to understand and in catering to all types and sizes of businesses. The highly coveted Green Mark award is presented by the London Environment Centre and supported by the London Development Agency and European Social Fund. EMAS is a voluntary European Commission registration scheme aimed at organisations committed to continuously improving their environmental efficiency by employing a formal EMA. 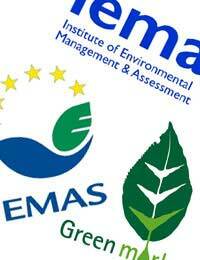 EMAS is a very highly regarded scheme, being strongly backed by both the government and environmental regulators. Organisations that participate in the scheme are given enhanced credibility and recognition for their endeavours because are required to regularly report their performance in the form of a public environmental statement. What is IEMA Acorn Scheme? The IEMA Acorn Scheme also comes with a recommendation from the government and is an officially recognised EMS standard. It centres on environmental improvements that are linked to business competitiveness and is flexible to enable any type of organisation, regardless of size or nature, to get involved. The IEMA Acorn Scheme differs from the more systematic EMS approach of EMAS and ISO 14001 in providing tangible results at a very early stage, so that companies are quick to experience the positive effects on their environmental performance. First devised at the 1992 Rio earth summit, the ISO 1400 is an internationally recognised series of international standards for effective environmental management that covers every aspect of how an organisation operates. Its potential positive commercial and financial benefits to companies who employ an ISO 1400 certified system are well documented. It is said that companies with an annual turnover of £20 million typically generate annual savings of £100,000. Where Can I Advertise My Green Accreditation? Green accreditation is not to be confused with eco-labels, which appear on products as a mark of their green credentials in order to tempt the more ethically minded consumer. In fact users of certified or registered EMSs are not supposed to advertise the fact on any products they produce. However, you see it mentioned on the company sign, on their website or on their headed notepaper. One of the chief reasons why these accreditation awards are not meant to be treated like eco-labels is because, unlike an eco-label, the employment of a recognised environmental management system does not guarantee their product meets a certain standard. It simply attests that the company has a system in place to tackle the environmental impact of their operations.